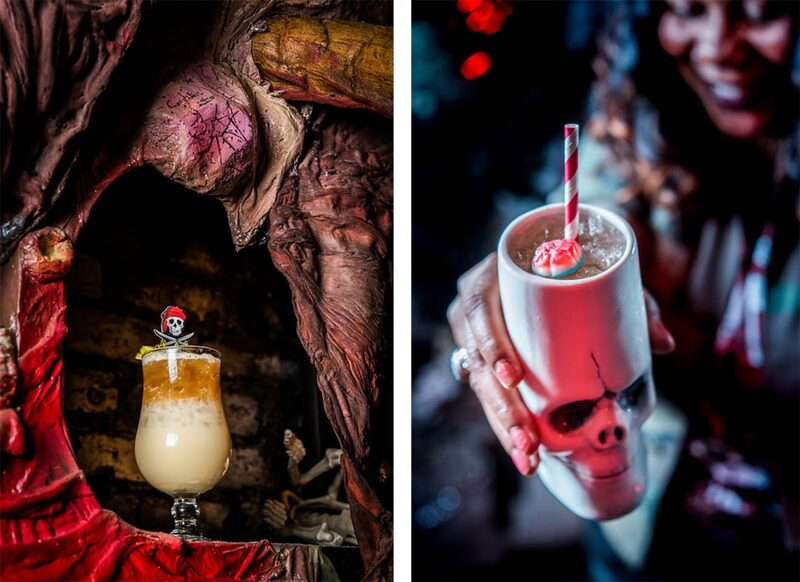 Ditch your typical neighborhood hangout and opt for an eye-popping experience filled to the brim with blood and other spooky details perfect for the Halloween season. 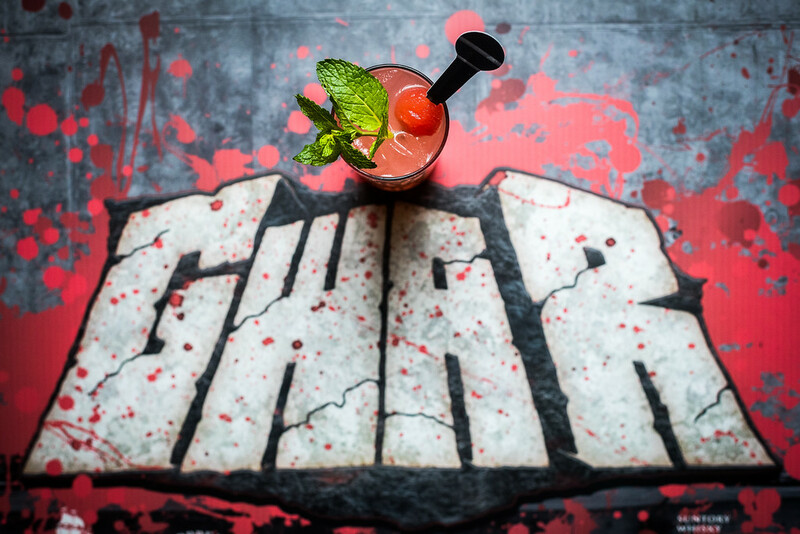 Since September 6, Drink Company’s pop-up bar in Washington, DC’s Shaw neighborhood has been rocking out to the theme of GWAR. No, that’s not a misspelling or acronym — GWAR is a Grammy-nominated metal band known for donning Satanic-looking masks and dumping buckets of synthetic blood onto the audience. Thankfully, guests of this pop-up bar won’t have to worry about getting messy. Instead, the one-room bar “retrospective” offers quirky cocktails and an eerie ambience filled with various original stage backdrops. Near the entrance, guests will find the shock rock band members’ classic, grotesque costumes, while in the back, there’s a replica of a 20-foot “World Maggot” and an intergalactic battle scene between late band leader Oderus Urungus (real name Dave Brockie) and Mr. Perfect. 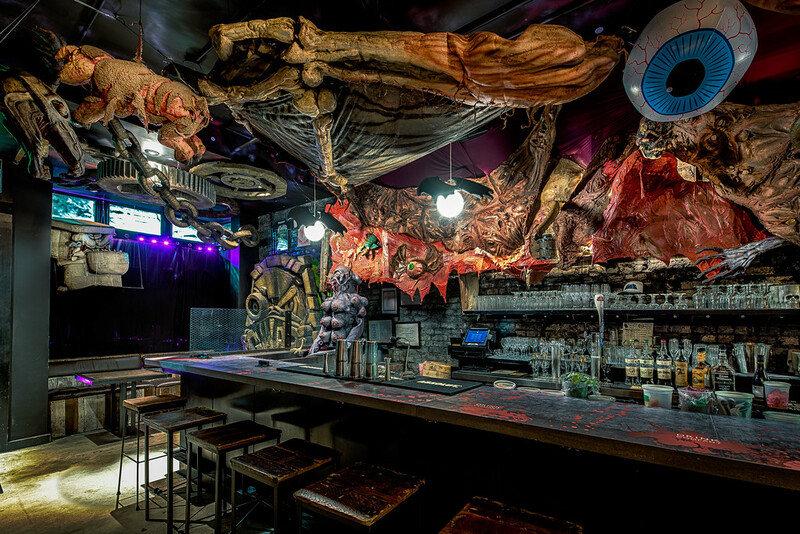 Drink Company President Derek Brown claims that guests don’t need to be fans of all things extraterrestrial to be delighted by the GWAR PUB. “If somebody is into gore, theatrical makeup, monsters, comic books, metal, punk rock, art, you name it, you can find an entry point for GWAR PUB,” said Derek. GWAR was formed in 1984 by a group of art students from Richmond’s Virginia Commonwealth University (VCU). The band members each have outlandish names like Bälsäc The Jaws ‘O Death or Beefcake the Mighty, and their backstory is lengthy and complex, reaching the deepest depths of outer space. Their music and stage antics often contain satirical messages. For instance, prior to the presidential election in 2016, the band featured performers dressed as monstrous versions of Hillary Clinton and Donald Trump, who later battled on stage. The group has released a total of 14 albums and 13 feature videos, as well as comic books and cartoons. “GWAR is a phenomenon. They’re one of the longest running cult bands that have ever existed,” said Derek. If you’d prefer to drink a cocktail than read the mythical lore of GWAR, no worries. There is a long list of odd-named, but oh-so-delicious beverages worth partaking in, from the “Richmond Happy Meal” shot, which is a Miller Highlife with Evan Williams Black Label Bourbon, to the “Jagermonsta Colada,” which is basically a piña colada, but with a Jagermeister float on top. 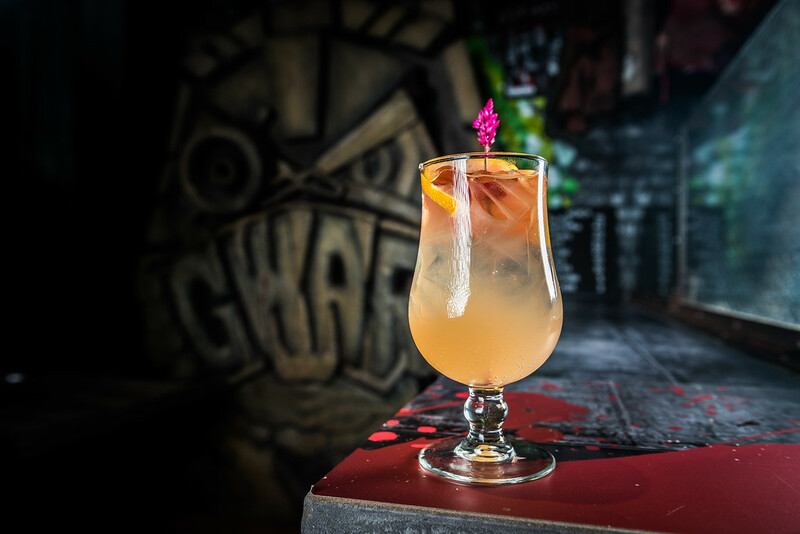 Other notable mentions include the “Oderus Eternal,” which is St. George Green Chile Vodka with Manzanilla, grapefruit, and Perrier, and the “Gilded Lily,” which offers Macchu Pisco, Blackstrap Rum, Szechuan Ginger Cordial, lime, and Perrier. Drink Company is known for hosting several themed pop-ups that have fostered lines where people have waited two hours or longer, no matter the weather. Past themes have included the spring-centric Cherry Blossom bar, nerdy Super Mario Bros., and doomed Rick and Morty theme, which ended up never publicly opening due to a cease-and-desist from Turner Broadcasting and Cartoon Network. 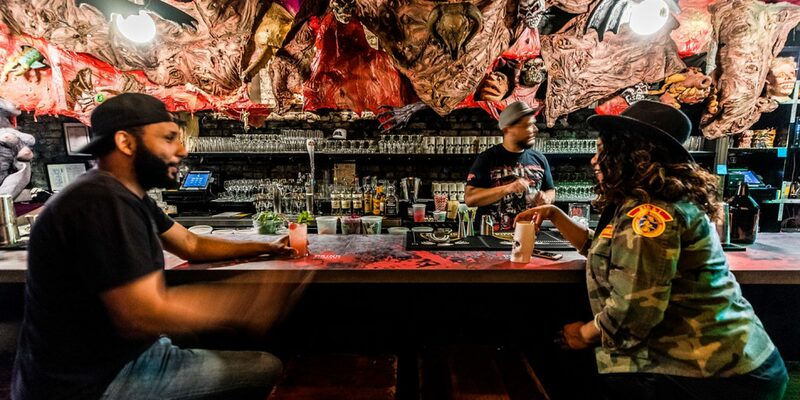 For those interested in taking a peek inside the GWAR PUB, it will be open through October 31, running from 5pm to 12:30am on Sundays through Thursdays and from 5pm to 1:30am on Fridays and Saturdays. It’s located in Shaw with T-shirts and other memorabilia available for sale on-site. On Halloween, the pop-up’s final night, all door sales will be donated to DKMS, an international non-profit dedicated to fighting blood cancer and blood disorders. Choosing this non-profit was in part inspired by GWAR guitarist Mike Derks, who was diagnosed with myelofibrosis in 2017. Want more spooky things to do this Halloween? Check out our guide for the best Halloween happenings in DC! Michelle Goldchain is a Washington, D.C.-based journalist, photographer, podcaster, YouTuber, and visual artist. Her bylines have been seen in Washington City Paper, DCist, Curbed, Eater DC, Racked, Recode, Vox, and Whurk Magazine. She is the founder of the newsletter and podcast, Capital Women, which is focused on women in D.C. She is also the co-creator of the YouTube show, Artsplained.